Cowen raises its price target for AMD shares, predicting the chipmaker will report better-than-expected profits in 2019. The firm's analyst predicts AMD's server chips will gain market share from Intel next year. Cowen is more optimistic on AMD's future gains in the server chip market after meetings with the company's chief executive. The firm raised its price target for AMD shares to $25 from $21, predicting the chipmaker will report better-than-expected profits in 2019. The stock closed at $18.94 Friday. On Thursday AMD shares rose 14 percent, a day after it reported better-than-expected second-quarter sales and earnings results. "Following AMD's strong 2Q18 results and de-risked 2H18 outlook posted last Wed, we hosted CEO Dr. Lisa Su for meetings in NYC on Thurs.," analyst Matthew Ramsay said in a note to clients Monday. "Investor interest was high and the message was upbeat but still unsatisfied, as management is determined to capitalize on share gain opportunities in datacenter and client markets. Dr. Su's message was AMD is just getting started; we agree." 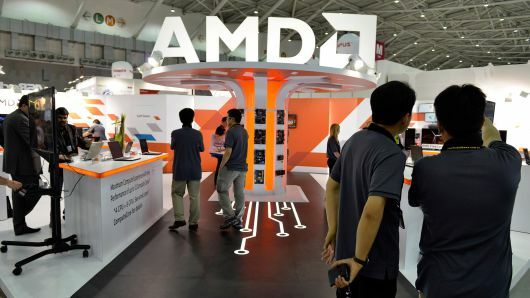 AMD sells high-profit-margin server chips to data centers and cloud computing providers, which companies use to add capacity to serve their customers. The company's shares are up 6 percent Monday. Its stock price is up 84.2 percent this year through Friday versus the S&P 500's 5.4 percent gain. The year-to-date return is the third best stock performance in the S&P 500. Ramsay also reiterated his outperform rating for AMD shares. The analyst noted Intel's guidance last week that said its 10-nanometer chips will be released for holiday 2019 compared to AMD's 7nm products' launch later this year. "We believe investors have turned focus toward AMD's core businesses poised to benefit from substantial share gain opportunities against Intel in the PC and datacenter CPU markets (supplemented by modest datacenter GPU gains) as 7nm products ramp later this year and more fully in 2019," he said. As a result, the analyst predicts AMD will generate earnings per share of 82 cents in 2019 versus the Wall Street consensus of 62 cents.